A hugely impressive and versatile controller with the added 'X factor' of that touchscreen. Fully configurable touchscreen control. A vast array of different control options. Good design. Only works on Mac. You still need your mouse and keyboard. The MC Control improves on the MC Mix by adding a touchscreen. 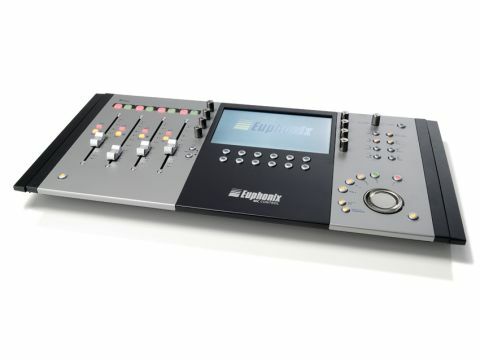 Faders are automatically assigned to banks of four tracks. Unlike the majority of controllers, the MC Control connects via Ethernet. You can make your own button assignments. The MC Control follows in the footsteps of the impressive MC Mix, but crucially, offers control of more parameters thanks to its configurable touchscreen. Could this be the missing link between you and your DAW? The unit is a sleek affair, with styling that echoes that of the MC Mix. This is perhaps most evident on the unit's left-hand side, where a bank of four channel strip faders lies in wait with associated Selection and Record buttons. Similarly, the right-hand side of the upper surface contains several of Euphonix's instantly recognisable buttons, with the option to switch pages, nudge events back and forth, jump between different banks and even switch applications all present here. Towards the bottom right-hand corner, a jog/shuttle wheel is surrounded by transport controls, while the MC Mix's unlabelled Shift buttons are present in both bottom left and right corners, enabling access to secondary controls. The central touchscreen is flanked by a column of four dials on each side, while two rows of six 'soft' buttons lie beneath. Round the back, you'll find the AC power inlet and the all-important Ethernet connection. As with MC Mix, MC Control is a Mac-only controller. Installation of the EuCon software is required to ready MC Control for use and further setup may be required depending on the application(s) you're intending to use it with. As with MC Mix, if your DAW isn't compatible with the EuCon protocol, MC Control can use the Mackie Control protocol instead. Once the software is in, simply power up MC Control, boot your DAW and away you go. The installation and 'pick-up' of the controller is absolutely effortless. It just works. The MC Control is certainly impressively laid out. We tested it with Logic Pro (it's also compatible with Nuendo, Cubase and Pro Tools) and Euphonix should be applauded wildly for the sheer number of functions its transcribed from this program directly into the unit. From the moment you boot a new session, groups of four tracks at a time are controlled directly from the sliders. As with MC Mix, it's possible to move down through your tracks in single steps, or in groups of four. You can select one of these four tracks as your target track on the screen and thereafter you can do pretty much anything you like to it. The knobs around the screen call up specific functions and help drive your editing. At the top level, they allow access to your chosen channel's inserts, pan, auxiliaries and the like. Selecting Inserts, for example (by pressing the relevant knob), then drops you down a level and maps the plug-ins you have set up, one to each knob. So, say you then press the Channel EQ one, the frequency, shape, Q and gain controls for each band are then all assigned to their own dials. You can arrow to the left or right through pages to access frequency bands which aren't covered by the first screen, so getting around is straightforward. "Installation and 'pick-up' of the controller is absolutely effortless. It just works." Pressing Back takes you back up one level, or you can shift-press this to get back to the top level in an instant. In this respect, the MC Control is straightforward, but in others, it's less so. For instance, at this top level default screen, one of the dials is for pan. As it's a rotary dial, you'd assume that by turning the dial, the pan position would modify, but it doesn't - not until you enter pan mode by pressing this dial first. Then, pan switches from being the second dial down on the right hand side to becoming the first dial on the left and, thereafter, works. Somehow, this doesn't seem as intuitive as it might. Dials aside, it's the virtual buttons on the screen which are designed to do your bidding and there are tons of them. In Logic, there are seven screen pages of buttons in the Track sub-menu alone, with up to 24 coloured, labelled buttons per page. These include File commands such as New, Save and Close, the opportunity to open specific editing windows like the Mixer Environment or note editor and others to take control of automation, for instance. These examples are the tip of the iceberg however - we could easily write pages by simply listing the functions Euphonix has mapped so that the MC Control is ready to use straight out of the box. Below the touchscreen itself, two rows of six 'soft' buttons access additional commands such as too selection. As with computer keyboards, experienced users need to learn where specific commands are by feel and this is more easily done with a physical button than with a touchscreen. The screen is user-configurable so if you don't like Euphonix's layout of buttons, you can create your own. The MC Control is a seriously good product, with the sheer range of functions over which it can offer control putting it head and shoulders above most of the competition. If you're sold on the idea of getting away from your mouse and keyboard, this is precisely the kind of controller you should be checking out. However, while some of your DAW's functions are much more straightforward to access and change via the MC Control, others are as (or more) time-consuming to operate than they might be with a mouse and keyboard. This isn't a criticism but an insight into the challenge Euphonix has set itself by packing so many functions into MC Control. Credit to the company for meeting the challenge head on and, in most respects, delivering the goods.